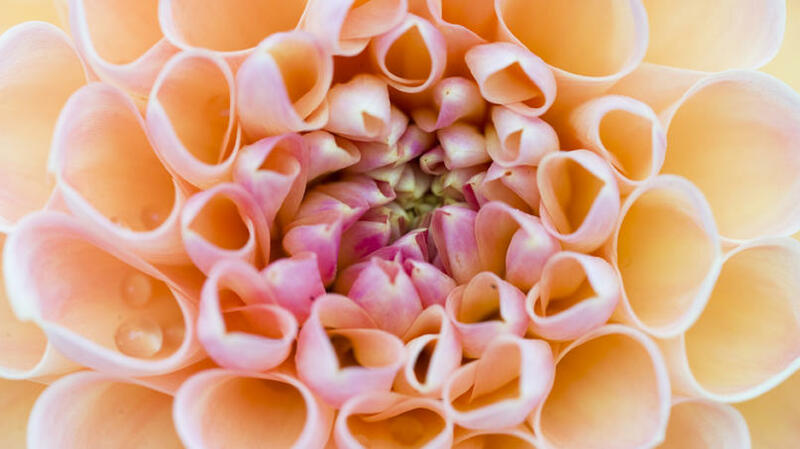 This guest post comes to us from Brooke Wetzel, florist on BloomNation, “the Etsy for flowers”, and Owner of The Plum Dahlia in Los Angeles, CA. The waning days of summertime in floral talk mean its time to relish the late-summer blooms, especially the glorious dahlia. Weather permitting, dahlia season can extend all the way to Thanksgiving, and here are the best tips to keep them happy as a cut flower. Dahlias brought home from the flower or farmer’s market should get dropped in water as soon as possible. In order to maximize their relatively short 3 to 4 day vase life, warm or hot tap water is ideal. I’ve found that dropping them in a vase of hot water and letting it cool to room temperature can extend their vase life up to 2 to 3 days. Tighter, compact varieties like last longer than the large and showy ‘Cafe au Lait’ and other dinner plate varieties, so named because they’re as big as a dinner plate. As a rule of thumb, the larger and fancier the petals, the shorter the vase life. One of my favorite pairings is using complementary colors like deep plum purples, oranges, and newer corals. Here are other great tips that apply the color wheel to your bouquet arranging. I like simple cylinders to let these summertime gems shine. A clean, clear glass vase can let the blooms breathe, and luckily, dahlia stems aren’t prone to molting or mucking up vase water. A dose of flower food can also work wonders to keep the water clean and clear. If you’re dressing an outdoor table, be sure to keep these blooms out of direct sunlight. They will wilt in the heat of a midday barbecue and are better suited for a dusk al fresco dinner party or shaded brunch. They are ideally suited for a long and low arrangement where guests and friends can see the tiny details and textures of your creation. Another option is a high/low mix of cylinders to have fun with the possibilities of colors, shape, and varieties. Whichever style you choose, these beauties need little fuss and play very well on their own.